Danny Glover is well known for his political activism, and has frequently spoken out in support of Venezuela. 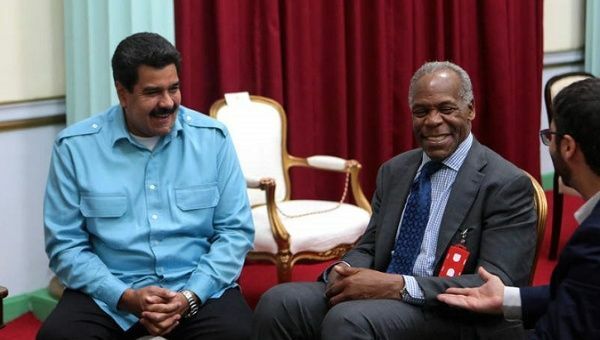 May 17 (teleSUR) Outspoken U.S. actor Danny Glover has called for the international community to respect Venezuela’s elections, scheduled to take place on May 20. “Venezuela is a vibrant and contentious participatory democracy where citizens have the last say at the ballot box,” Glover said in a video circulated on social media. The actor highlighted Venezuela’s advanced, modern electoral system, which has been widely recognized as one of the most reliable in the world, as well as the fact thatinternational observers will be in attendance. Glover is well known for his political activism, and has frequently spoken out in support of Venezuela. He attended a meeting, along with Harry Belafonte and Cornel West, with former Venezuelan President Hugo Chavez in 2006. The actor was among the most prominent voices in the United States opposing the U.S. invasion of Iraq in 2003. Aside from politics, Glover is well known for his roles in movies such as the Lethal Weapon series, The Color Purple, Predator 2, and Saw.